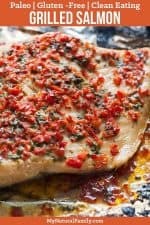 This 30 Minute Red Pepper and garlic butter grilled salmon in foil recipe is so lovely you’ll want to eat it every night. Just look at this garlic butter grilled salmon in foil Recipe – isn’t it so pretty? You would be sure to impress guests or your family when you make this. Plus – as a huge bonus – it’s healthy and comes together in only half an hour. Salmon is a bit stronger of a flavor than other fish, so it’s perfect that this sauce has red peppers and herbs to balance out the flavors. The salmon is sooo good served over a bed of arugula that has been dressed with a little salt and lemon juice. 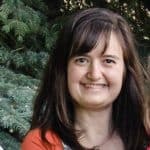 Last weekend my husband and 11-year-old son went on a camping trip with the scouts, so I had a sleepover at my house and invited four of our girl cousins over. So that makes seven girls, including my three girls. The moms, my sister, and my mom came over and I made them this salmon on our grill and it turned out perfect. Some of them had some fresh corn on the cob and garlic bread with it and it made for a really good meal. We figured the girls wouldn’t want any, so we ordered pizza for them. My girls tried a little and liked it, but not better than pizza. It’s hard to compete with pizza. Kind of ironic I made it while my son and husband were gone because they both love fish and probably eat it twice a week and they both love to fish, partly because they love to eat the fish. After dinner, we all walked to the park and played Pokemon Go, which I totally don’t get, but if it makes my children walk and ride their bikes more, it can’t be all that bad. What do you think of Pokemon Go? Is that even how you spell it? 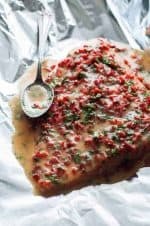 If you like this easy garlic butter grilled salmon in foil recipe, you will probably love my oven-baked lemon crusted salmon recipe here. 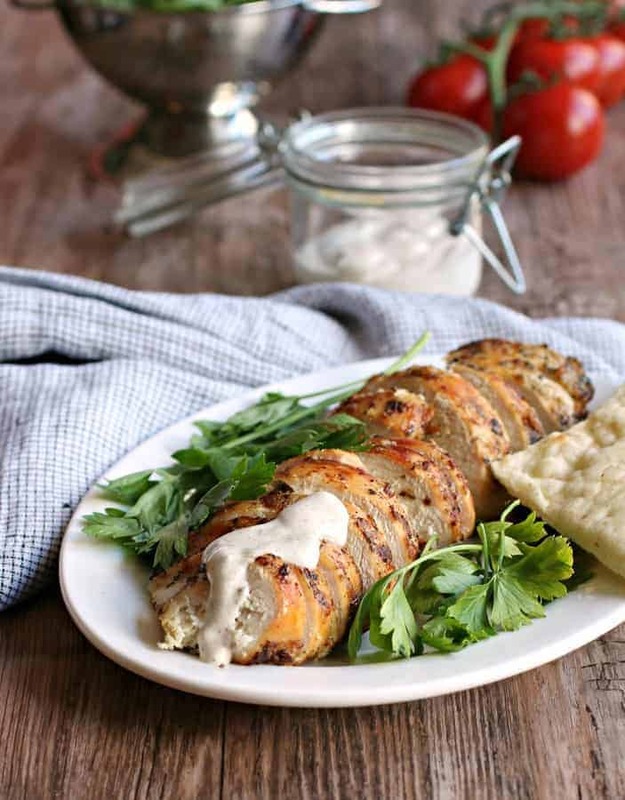 It’s one of the most popular recipes on my blog and could probably be grilled similar to this recipe and turn out just great. I also bet this goes well with other types of fish. I would love for some of you to tell me if you try this with other types of fish and tell me how it turned out. How do you know if salmon is done? Cook salmon 6 minutes for every half-inch of fish. You can check it with a fork to see if it flakes easily. If it does, it’s done. Do you eat the skin of the salmon? I’d say this is personal preference. You won’t catch me eating the skin, my teeth aren’t that sharp. Although I have been known to eat the skin of a trout, I think that’s about it. However, if you can a great desire to eat the skin of the salmon, go ahead and do it. It won’t hurt you as long as it is cooked well. Actually, the skin is full of all the healthy fats that come along with eating fish. Can you get sick from eating undercooked salmon? That depends on who you ask. Some people say you can’t get sick from eating undercooked salmon. Other people say it may have tapeworm larve waiting to take up residence in your belly. That decision is up to you. You won’t catch me eating undercooked of any kind. How do you know if salmon has gone bad? Fish that has gone bad will have an unpleasant fishy smell or it may smell somewhat sour or like ammonia. Fresh salmon smells similar to the sea with a mild aroma. Can you eat salmon out of the can without cooking it? Canned salmon was cooked when it was canned. Just drain the liquid off and add it to your favorite dish, it’s ready to eat straight out of the can, just like tuna fish. This Paleo salmon only has a few ingredients and cooks up in less than 30 minutes. On a flat surface, lay out two pieces of foil (12” long each) with the pieces overlapping in the center. Place the salmon in the center of the foil. In a mixing bowl, stir together the butter, garlic, cilantro, bell pepper, salt, lemon, and honey. Spoon the mixture over the salmon so that the fillet is fully covered. Fold the longest ends of foil over the salmon. Roll up the two ends of foil so that the salmon is completely enclosed in a packet. Place the Foil packet on a grill heated to medium. Cover the grill with the lid and let cook for 12-15 minutes. Salmon will be firm and flake easily when done. Carefully remove packet from grill, open packet, and slice. Serve! I haven’t tried a lot of these alternatives – so if any of you have, please comment below and let other readers know what works as an alternative to aluminum foil. I love salmon too! I have salmon is my freezer too, I’m going to have to try it too! I love salmon, this sounds delicious. I’m going to try it on the salmon that’s in my freezer.